Have you ever heard a cover of a song that is more fun than the original? Then you’ve been to Arlene Zelina’s YouTube channel. This Australian singer is known for her viral covers featuring her insanely flawless vocals. She’s covered Beyonce, Rhianna, Justin Bieber, Drake, Celine Dion, and more. Her cover of Maroon 5’s “Moves Like Jagger” has been viewed over fourteen million times. Fourteen. Million. So… you get it. With her charming personality that shines through her videos, Zelina’s career really took off when she came to Los Angeles and started capturing the attention of international celebrities such as Ryan Seacrest, Jason Derulo, and Ellen DeGeneres. She’s performed at some insane events, too. You may have seen her at Google’s Big Tent event, various YouTube Launches, or showcasing her original material at venues across the world. Otherwise, what have you been doing?! What’s next? Brand new ORIGINAL material — We cannot hide our excitement. Zelina’s team tells us she’s been working with music’s top award winning producers, whose previous collabs include Selena Gomez, Justin Timberlake, Fifth Harmony, The Black Eyed Peas and more. We’re told it’ll be her biggest swing yet — new look, new sound, new feel. The sky is the limit for this artist and these new tracks. Check out her videos to get hyped for what's coming: www.youtube.com/arlenezelina. If you need us this summer, you'll find us blasting AZ’s song. On repeat. Sorry in advance. Admittedly not a tracksuit, but I am OBSESSED with track pants, tops, suits, LEISURE WEAR! Hello ladiesss! I don't know about you, but I am pretty freakin' obsessed with tracksuits/ sweatsuits, especially now that Fall is right around the corner (eeeeee!!!!!). So, there is a little back story on my new found obsession, other than the obvious reasons like the fact that they are so comfy and look sporty and cute when you don't want to put anything together. I've been super into surfing Youtube lately and stumbled upon this video of Kris Jenner giving a closet tour. She basically had an entire wall dedicated to her tracksuit/sweatsuit obsession!! I thought to myself, " Kim, you need to get on your tracksuit game!" Seriously, they are the perfect quick uniform for my daily dog walks and dog park visits while still looking super cute, trendy, and easy going. I have been searching constantly for good mix and match options as well as suits that come as a pair and have found some really cute options! I am particular to sweatsuits with a hoodie to look street style chic, but the tapered ones with the zip fronts are perfect for when you want to look more polished! Check out my favorite options below in each category. Whats not to love? Throw your hair back into a top knot with some hoops and youre looking FAB! I just love the effortlessness of this look so much! Do you guys? I wannnnna knowwww! As many of you know, Chay and I are living in Silver Lake these days and love our home so much! It's modern but cozy and has that West Coast Modern vibe to it that we love with big windows, clean lines, and views of the hills where we live. It's a bit small for some peoples taste, but for us it's perfect! It comes in at 1,350 square feet, but the outdoor space makes it much more usable, with two decks and a terraced yard with lots of lush California landscape. We LOVE IT! So, what is this new project we are kicking around? 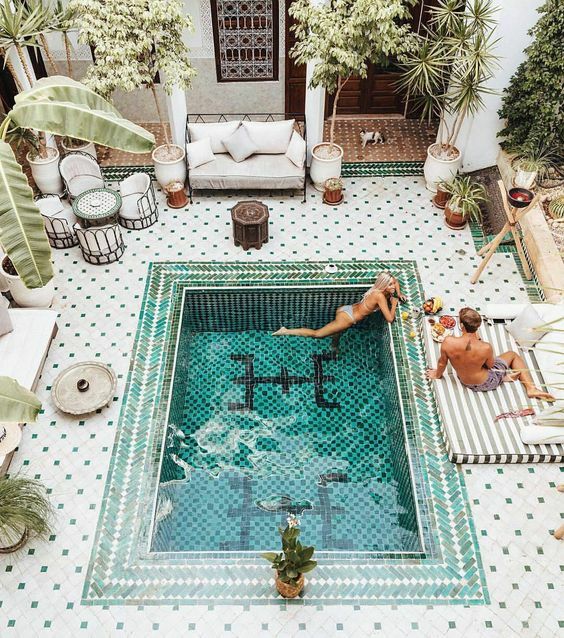 Welp, it's been a hot summer here in LA and we have been dying for a pool....but a typical lap pool is not an option in our yard due to the hillside and deck space. I've been doing my research and think a "spool" aka plunge pool could be the perfect option as we have the space on our bottom deck. I'm obsessed with these options below as inspo for the direction we can go in. What do you guys think? Let me know! I'd love to get your input! All Images taken from my Pinterest Boards// Follow me here to see more of my favorite interior inspo ! Let me know which ideas you love best in the comments below! We're super excited to find out contractor and get going on this project. Stay tuned for updates!! Today I want to share the top 5 tips that helped me organize my thoughts when it came to designing my dream closet (with the space we had to work with of course....it could always be bigger!) so that I could organize my clothes in order to have the most efficiency when it comes to getting dressed and ready to go every day! It's super important (whether you have a tiny NYC apartment or a huge walk-in) to be able to see the things that you have and love in a clear way so that pieces don't get lost in the mix, and therefore invisible and gone forever! You know it's true. If you can't see it, it basically doesn't exist. When we moved into our home, there was no real closet in the master bedroom, just some Home Depot metal shelving that was clearly put up for men's clothes plus it was ugly and not set up for women's clothing i.e. dresses, robes, kimonos, shoes, etc. I contacted California Closets (not sponsored) because I had heard great things, and was able to map out the entire space we were working with and give my designer an exact inventory of all my clothes and accessories that needed space in the new closet. That way, there would be no surprises. Everything was accounted for. I also knew I wanted my shoes to be visible, front and center, and covered from dust, so we decided on gorgeous white wood frames with glass fronts and I chose vintage hardware for the handles. Check out more photos below and learn what my top 5 tips are for organizing your dream closet! A shoe cabinet keeps the dust away! 1. Get rid of anything and everything you're not crazy about- If you don't love it, you won't wear it. I understand sentimental value, but realistically, if you haven't worn it for a year, you probably don't LOVE it. Of course, I don't mean classic pieces that age well or seasonal pieces, but items you look at and think "eh"... get rid of it. It's just taking up valuable real estate and ain't nobody got time for that! 2. Color Coordinate- Color coordinating your clothes allows you to know where pieces are more quickly and allows you to dress for how you feel. During the winter, I don't wear that many bright colors so it's nice that all my black and darker colors are in the same area. I go from white to pink, to red, and down the line of the rainbow from there with my black towards the back since I don't have a ton of black. 3. Hang according to sleeve length- I like to hang my tops from tank/strapless styles at the front to long sleeve toward the back of that particular color. That way I know exactly where specific pieces are that I am looking for. Looking for that pink tank? There it is! 4. Create space for hanging bottoms- I used to fold and stack my pants/shorts/skirts because there just wasn't enough space to hang my bottoms. I was so used to folding and storing bottoms in a dresser, that I didn't even think to ask to have a space to hang them. Thank goodness my closet designer suggested it because now I see exactly what I have and don't forget about that cute A.P.C skirt that I love so much! I love seeing what I have to work with laid out right in front of me! 5. Create some space for accessories (purses, luggage, belts, hats)- I always thought of these items as an afterthought, but as I have gotten older, I have a couple nice bags I need to store when not being worn, luggage that needs to be stored when I am not traveling, and belts that should be hung, not crumpled up in a drawer somewhere. We made sure to include shelving that was taller than the tallest purse and big enough for my hats, belt hooks on rolling tracks that come in and out, and space at the very top of my closet to fit my suitcases neatly. It makes me so happy to know that everything has a place! Without planning these details, my closet would look like a bomb went off with purses and hats thrown about, squeezing into blank spaces. Do you guys have any tips that you feel are musts for your closet? Share in the comments below! And for more on this topic, visit my IGTV for a tour/ explanation of how I organized everything and why I love it!! See that on my Instagram here! I just got back from a whirlwind 5 day trip to NYC and saw so many pieces for the home that I fell in love with and wish I could have brought back with me. We went to a ton of shops and got inspiration for our homes and new and fresh ways to put them together! Have I mentioned how much I LOVE NYC?! It is my favorite city in the world with its contagious energy and on the go lifestyle. Today though we're looking at dining chairs! l I have had quite a few friends over time ask me to help them piece together their homes and one thing they always get a little stuck on is which dining chair to choose. I get it. It's hard to buy 6 of one thing because no matter how much of a deal you got, its still multiplied by 4, 6, or 8 + and that's $$! Dining chairs are definitely one item you need to plan on spending at least a bit on. 3. Or you have to be comfortable with going to "big box stores" and knowing what looks designer and what looks big box. Hint: many things look big box if they are from big box stores so you really have to pay attention to the details, which ones you buy from, and if you are seeking help, you need to take the advice of the person helping you. Okay! So as much as I do love consignment and vintage shopping for my home, it's not feasible for most clients on a time crunch because it takes timmmme. 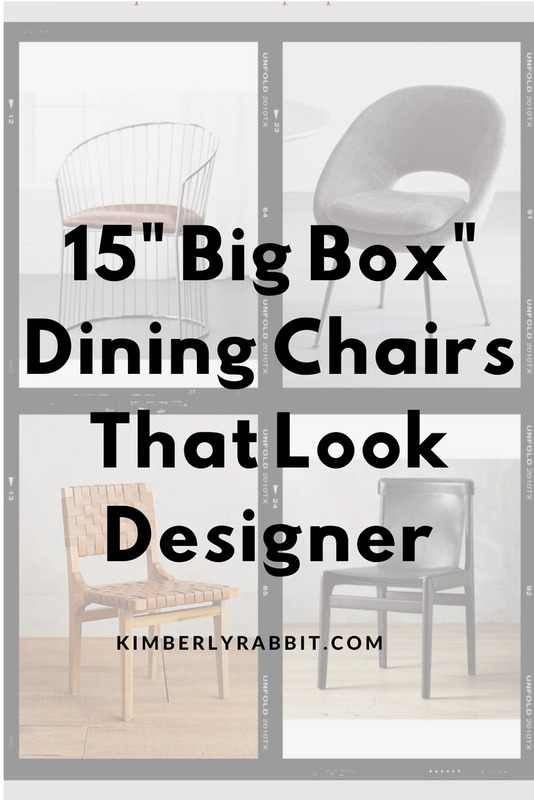 So, I rounded up my favorite current "big box" dining chairs in a range of prices that will help you get the look you want without spending thousands on the designer one you really want. Below are some of my favorites! Check them out and let me know which ones you love! As of late, I have been obsessed with oversized blazers because they are effortless, chic, they always pull together an outfit. Plus they dress up a super casual outfit in a jiffy (think cut off shorts and a t-shirt, a dress with sneakers, or ripped jeans and a simple tank)! I'm a sucker for ease while looking fashionable, so blazers are my go-to when I'm running low on time and need a pulled together look stat. I found this light weight one at Crossroads, one of my favorite consignment stores in LA, and it's a fave piece of mine from the collab by JOA x Chriselle Lim. I love it because it's super summery, oversized (at least the one I found at crossroads...It may be meant to fit tighter but I like the oversized fit of the one I found) so much so that it's almost a dress, and the fabric isn't fussy at all so I don't have to be precious with it. It's the perfect "throw on" piece. This look is kinda my cheating way to look stylish when I don't want to put much effort in. I find myself wearing blazers again and again through the summer for a polished look, but I opt for light weight and slightly long. Check out 11 styles below that I love as well as the details of my look. I'd love to know what you are loving and if you are into this look as well!